If you’re starting out or returning to an instrument I, Phillip Chalker, can help you get off to a flying start. I offer beginner, intermediate and refresher lessons for ukulele, and beginner lessons for guitar. You can take lessons at my place or, if you live in my area, in the comfort of your own home. For those who live a bit further away, we can have an online session using Skype or FaceTime. If you have a companion who wishes to learn with you, I also offer group sessions for up to eight people. You only need an instrument, a tuner and your desire to learn. and desire to start playing. Current fee for 1 hour lesson: $20, and slightly more for extra students. Contact me with your enquiries. 1. In the ukulele family there are four types: soprano, concert, tenor and baritone. The baritone uke is strung and tuned differently with chords like a guitar. 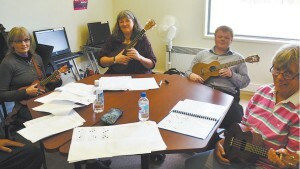 Learning is easier if you use a soprano, concert or tenor uke as your beginning instrument. 2. When you are looking for a new ukulele or guitar, try different types to see which is the most comfortable for you to select notes or chords. For those of us with fat fingers, this is quite important. 3. To get a good sound place your fingers between the frets (the metal bars on the neck of the ukulele) and make sure all the strings ring out. 5. Having trouble finding a suitable instrument? Ask your music instructor for guidance with local shops or online purchases.